YEREVAN (RFE/RL)—Most of the contracts required for the upcoming delivery of large amounts of Russian weapons to Armenia have already been signed, according to the Russian ambassador in Yerevan, Ivan Volynkin. Armenia is to pay for them with a $200 million loan which Russia pledged to allocate to in 2015. The Armenian government moved to speed up the implementation of the arms deal following the April 2 escalation of the Nagorno-Karabakh conflict. The government instructed the Armenian Defense Ministry to negotiate supply contracts with relevant Russian government agencies. “We are now working on the signing of the contracts,” Defense Minister Seyran Ohanian said during his April 27 visit to Moscow. Meeting with Russian Prime Minister Dmitry Medvedev in Yerevan on April 7, Prime Minister Hovik Abrahamian complained about a “certain slowdown” in the implementation of the $200 million deal by Rosoboronexport, Russia’s state arms exporter. He asked Medvedev to help “conclude the contracts” with the Armenian side. In February, Moscow disclosed the types of military hardware which Yerevan will be allowed to buy with the Russian credit. The deadliest of these weapons is the Smerch multiple-launch rocket system and TOS-1A heavy flamethrower designed to destroy defense fortifications and enemy personnel with thermobaric rockets. Russia has reportedly sold 18 Smerch launchers and as many TOS-1A systems to Azerbaijan along with more than 90 T-90 tanks, over 30 combat helicopters and other offensive weapons. The Russian arms deliveries to Armenia’s arch-foe, reportedly worth about $5 billion, stemmed from contracts signed in 2009-2011. Armenian leaders stepped up their criticism of those arms deals immediately after last month’s Azerbaijani military offensive in Karabakh. Medvedev effectively rejected the criticism, saying that Moscow sells weapons to both Armenia and Azerbaijan and thereby sustains the “military balance” in the Karabakh conflict. Volynkin insisted that that balance has not been disrupted by the Russian-Azerbaijani defense contracts. Russia regards Armenia as a “strategic ally” and will continue to supply it with “the most advanced weapons,” he said. “We will do everything in our power to preserve this allied relationship,” added the diplomat. Ohanian similarly stated on April 27 that Yerevan will not reconsider its close military and political ties with Moscow. “I don’t see a single fact indicating that our strategic relations have been somehow disrupted or changed,” he said. Armenia can also spend the Russian loan on buying, at discounted prices, Russian-made anti-tank weapons, shoulder-fired surface-to-air missiles, demining and communication equipment, armored personnel carriers and heavy military trucks. The anti-tank systems include 9M133 guided missiles that first went into service with the Russian army in the late 1990s. The 135-milimeter rockets can supposedly destroy tanks within a 4-kilometer range. In 2015, the two sides also negotiated on the delivery of Russian Iskander missiles to the Armenian army. With a firing range of up to 500 kilometers, the sophisticated systems would make Azerbaijan’s vital oil and gas infrastructure even more vulnerable to Armenian missile strikes in the event of a full-scale war for Karabakh. An Armenian army general claimed in April that Armenia already has such missiles in its military arsenal. The Defense Ministry in Yerevan did not deny or confirm the claim. Armenia needs new allies. Russians are proven to be back stabbers and none liable ally. Armenians in Armenia with Armenians in diaspora should create a Military Defense Fund. We believe we have 10,000,000 Armenians in the world. Let’s say only 2,000,000 Armenians participate to this fund and pledge $1,000 per annum. Math: 2,000,000 * 1,000 = $2, 000,000,000. It’s two billion dollar per year. In handful of year Armenian would be one of the strongest countries in the region. 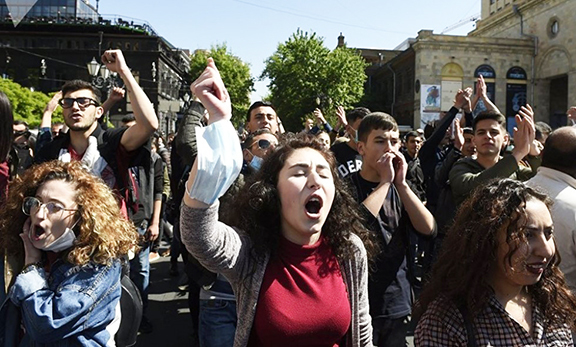 Armenian people are united, what we need is Armenian political parties, (inside and outside of Armenia), to be united. If we don’t implement something like the example above, shame on us and let the whole world curse us (as the poet said), and let’s not talk about Armenian Genocide anymore because we don’t deserve to be called Armenians. IT IS DOABLE!